Use a soft-bristled brush or damp cloth to brush off as much dirt and dust as you can. Dirt and debris are bad for leather; they can cut the fibers that hold the leather together. For smooth finish boots, use a sponge or cloth to lightly apply a leather conditioner. Use the conditioner only when the boots are dry. For naked finish boots, apply a non-silicone water and stain protector. This is the last step needed to treat naked finish boots. On average, leather boots should only need to be conditioned about twice a year. You do not want the leather to get oily and loose. If it does, then cut back on conditioning. Use a different cloth to rub a cream or gel-based leather polish to the smooth finish leather. The polish should be neutral (colorless) or match the color of the leather. The polish will rejuvenate the leather and will make the leather shiny and conceal scratches. Let it soak in for about five minutes. Complete the treatment process by rubbing a non-silicone water and stain protector onto the leather with a sponge or soft cloth. You can only apply protector to the boots if they have been polished. Let dry overnight. Use a soft-bristled brush to rub off debris, dirt or dust from the boots. Brush in one direction. Exotic leather includes alligator, ostrich, shark and kangaroo. Use a sponge or damp cloth to buff the leather with an exotic leather conditioner. Exotic conditioner is specially designed to get under the angles of exotic leathers, like the scales of snakeskin. Apply one thin layer over the leather, and let it soak in for about a minute. Keep applying thin layers until you have about five layers of conditioner. Dip a cloth into a cream-based leather polish and carefully buff the exotic leather with the polish, all over the boot. If the boots are black, brown or tan, use a polish in that color. If they are lighter-hued, use a neutral (colorless) cream-based leather polish. Let it soak in for about five minutes. Use a sponge or soft cloth to rub a non-silicone water and stain protector onto the exotic leather. Firmly rub it into the leather and let dry overnight. Lanolin-based conditioners are best because lanolin acts as waterproofing wax and is a natural moisturizer. 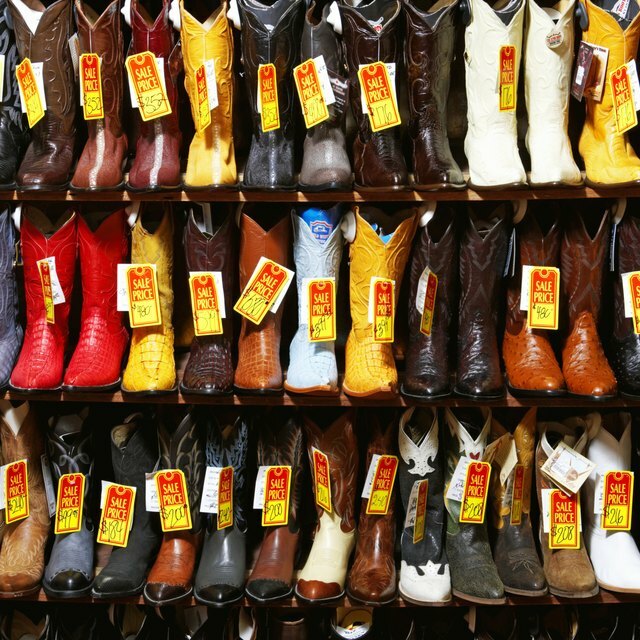 Let cowboy boots dry at room temperature; never dry over direct heat. Avoid mildew and mold growth: don't store boots in cold or damp places. Can You Use Mink Oil on Snakeskin Boots?